One of the earliest commercial winemaking operations ever established in Victoria. 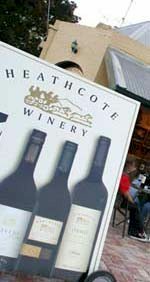 Heathcote Winery can also boast some of the oldest Australian plantings of Viognier. The winery building dates back to 1854 when it serviced miners seeking their fortune in the heady days of the Victorian gold rush. Shiraz with a splash of Viognier is predominantly sourced from estate vineyards on the periphery of Heathcote township, harvested just when the chunky tannins, cherry acids, natural grape sugars and bold red Heathcote earth characters are at their peak. Exclusively Heathcote Shiraz is treated to a Rhone styled co-fermentation with a small amount of Viognier, lifting the colour and infusing the aromatics with wonderful apricot floral scents, while adding body and increasing palate structure. Parcels are processed and vinified through individual batches to a regimen of old world winemaking techniques, including hand plunging in open vessels and pump overs in closed fermentation vats. Upon completion, Mail Coach is pressed and matured up to seventeen months in a selection of new and seasoned French oak barriques, crafted by a range of cooperages to facilitate complexity and encourage components to achieve their full potential. Deep scarlet red with purple hues. Lifted, regional nose of blackcurrants and dark berry fruit, menthol notes highlight toasted oak characters and carry aromatics onto the palate. Brooding in style, medium to full bodied wine showing dense regional fruit and impeccable balance. High end French oak contributes to a tasty, supple tannin profile, concentrated primary fruit suggests added complexity as the wine continues to evolve.